What rises to the level of an “icon” in Visalia? Its notable people, its longtime establishments, its familiar signs and symbols are all fodder for artists who respond to their local surroundings, histories, and touchstones. Visalia Visual Chronicle’s theme for 2013 will encourage (but not require) artists to explore these elements that give our city its identity. For the second consecutive year, Arts Visalia will host the Visalia Visual Chronicle exhibition, a juried competition intended to locate artworks for acquisition to a permanent, public collection held by the Arts Consortium, a non-profit 501(c)(3) organization that connects creativity, community and culture in Tulare County, California and acts as the strategic local partner of the California Arts Council. Established in June of 2011, the Visalia Visual Chronicle is a permanent public collection of artworks which celebrate the people, places and culture of Visalia and it’s surrounding region. Established in 2011, the Visalia Visual Chronicle was originally developed by local arts writer and curator Aaron Collins together with the support of McMillan Homes and is now under the stewardship of the Arts Consortium, with whom Arts Visalia has partnered in organizing and presenting the exhibition. The Arts Consortium seeks donations to support the purchase of these artwork candidates and, to date, six artworks have been acquired for the collection which could one day become a part a yet-to-be-conceived museum or cultural center of Visalia. 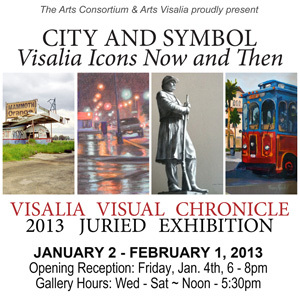 The exhibition will be on display at Arts Visalia January 2nd through February 1st, 2013, after which time the artworks will be on moved on a rotating basis to other public venues for the remainder of 2013. An opening reception will be held at Arts Visalia on Friday, January 4th from 6:00 to 8:00 p.m. Admission is free and open to the public.